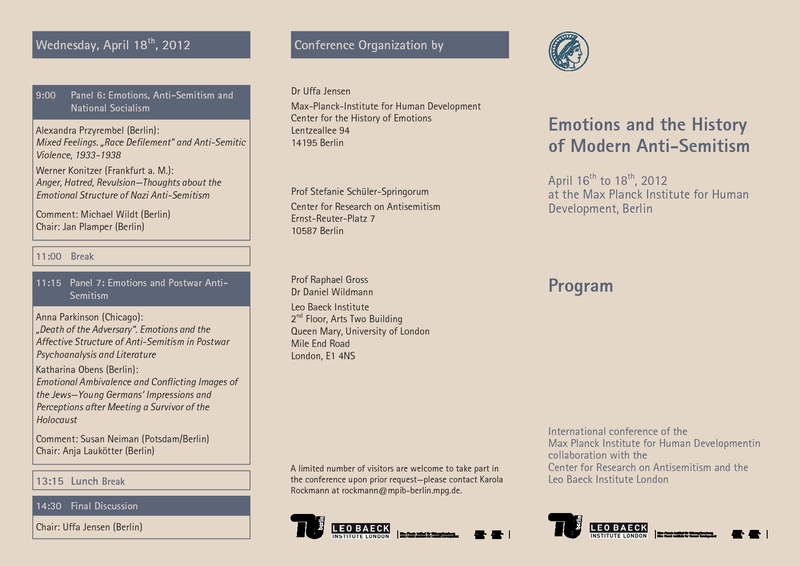 International conference at the Max Planck Institute for Human Development (MPIB), Center for the History of Emotions in Berlin organized by MPIB, Center for Research on Antisemitism in Berlin and the Leo Baeck Institute London. In his famous book, Anti-Semite and Jew (1946), the French philosopher Jean-Paul Sartre (1905-1980) described anti-Semitism as “something quite other than an idea”: as a “passion”. Indeed, on many different levels, anti-Semitism is an emotionally laden phenomenon. Anti-Semitic forms of communication (i.e. in texts, speeches, slogans, films, images etc.) rely on various emotions like hatred, anger, fear, disgust, resentment, envy, pride etc. The cohesive value of anti-Semitism for processes of group formation rests upon shared emotionality among its members. In cases of anti-Semitic violence, emotions also play a major role: particularly in pogroms, an emotional orchestration and escalation of the violent masses takes place. Frequently, anti-Semitism includes the condemnation of (allegedly Jewish) behavior as immoral. Thus, anti-Semites often employ moral emotions like indignation or resentment. Jewish reactions to anti-Semitism also display a variety of emotions as well: among them moral ones, but also fear, anger, pride etc. In spite of these obvious links, only very few historians have systematically investigated the connections between the history of emotions and the history of anti-Semitism. Historians of emotions, on the one hand, have studied the history of specific adverse feelings, such as hatred, resentment or disgust, but have isolated them from other emotions as well as from specific social contexts. Much work remains to be done with regard to social phenomena of hostility that, in real life, are often combinations of different emotions. In this regard, the history of emotions would benefit greatly from the analysis of a highly complex and historically enduring case like anti-Semitism. On the other hand, historians of anti-Semitism often rely on the implicit assumption that their task is to examine the ideological and cognitive elements in anti-Semitism, that is, the prejudices against Jews. The emotional and, as is often assumed as well, irrational aspects of anti-Semitism can either be neglected all together as a mere epiphenomena or relegated to the field of psychology. Apart from producing somewhat flat histories of anti-Semitism, such a treatment reproduces the view that emotions have no history and, as essentialized bodily components, only accompany the “real” history of cognitive notions against Jews. However, since the inseparability of emotion and cognition is, by now, a widely accepted finding in the interdisciplinary study of emotions, the cognitive bias in this historiography no longer makes sense. Emotions and anti-Semitic communication: This set of questions concerns the characteristic emotions of modern anti-Semitism in different forms of communication. What different emotions are used in anti-Semitic communication? Are these emotions always hostile or does emotional ambivalence structure anti-Semitic communication? How are the emotions presented by the “author” related to the intended emotions of the audience? Moreover, is it possible to discern specific emotional styles of anti-Semitism, that is, a specific mode of communicating emotionally? 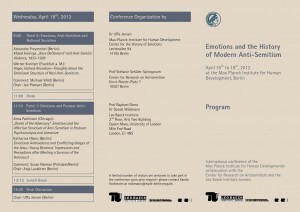 Additionally, the effects of emotions in anti-Semitic communication need to be explored. What role do emotions play for the reception of anti-Semitism? Is it possible to describe a specific mobilization and orchestration of anti-Semitism with the help of emotions? How do the opponents of anti-Semitism react emotionally to anti-Semitic communication? How do Jews react and use emotions in their counter-communication? Emotions and anti-Semitic practices: This series of questions is devoted to the role of emotions in the emergence of anti-Semitic actions, i.e. in verbal attacks, demonstrations, violent confrontations, organization of petitions, formation of associations etc. What anti-Semitic practices are generated by emotions? How are practices against anti-Semitism organized emotionally? What processes of group formation are visible through emotional mobilization? Is it, finally, possible to describe an emotional profile, a habitus of anti-Semites and their opponents? Concepts of moral self and anti-Semitism: Anti-Semitism is crucially concerned with issues of morality. Thus, relevant questions need to be explored in this regard: What notions of moral selfhood against an immoral Jewish selfhood are discussed in the emotional communication of anti-Semitism? In what way does anti-Semitism change emotional selfhood? Does i.e. hatred, resentment, or disgust of Jews alter other aspects of the moral self? What notions of moral economy are present in anti-Semitism? Changes in emotional history of anti-Semitism: The enduring and transnational history of anti-Semitism makes it possible to raise specific questions about its emotional development. Did the emotional composition of modern anti-Semitism change over time? How does it differ in different societies? Does the transnational dissemination and organization of modern anti-Semitism and its counter-movements create a shared emotional repertoire across borders? Panel 3: Anti-Semitism – Rational or Irrational? Please find more information on the website of the MPIB.